"Imagine every space in this room filled with people. Constantly being jostled and pushed. In the lower levels there is no quiet place. No peace. To a scrub, this room is paradise." I drew a deep breath. I'd spoken more in one burst to this stranger whose room I'd invaded than anyone else in weeks. And with a single word he could alert the Pop Cops and send me to the Chomper. We stared at each other for a few heartbeats. Before I could retreat he said, "My name's Riley Narelle Ashon. Any time you need peace, you're welcome to use my hideaway." I am so glad I had low expectations for Inside Out by Maria V. Snyder, because it blew my mind. I often set the bar high for books that I read and wind up disappointed, so I was quite pleased when the opposite proved true while reading Inside Out by Maria V. Snyder. Inside Out by Maria V. Snyder is a dystopia which takes place basically in this huge building structure. I can’t tell you what the structure is because that would be giving away so many spoilers. But if you aren’t slow you’ll probably figure it out much faster than me. Trella is a scrub which means she cleans the pipes of the building for the uppers. Everything changes in Trella’s world when an upper is banished to the lower levels. No, they don’t fall in love. The society is fascinating, as is how the people are controlled based upon population, rights, and how much living space each gets. You all know how much of a stickler I am for characters. Trella is exactly what I like in a protagonist. She is headstrong. She makes her own decisions and sticks to them. She’s also a loner, which I am able to relate to at times. I loved watching Trella grow and change throughout Inside Out by Maria V. Snyder. Honestly, she drives the story, her words will pull you in. Inside Out is told in first person, and will grip you until the very last page. Also, can we just talk about Riley super quick? Riley is a secondary character, and ahhh, awesome. He’s kind, smart, and there’s a scene with a stuffed animal which made me love him, you know in the way that you can fall for certain characters. 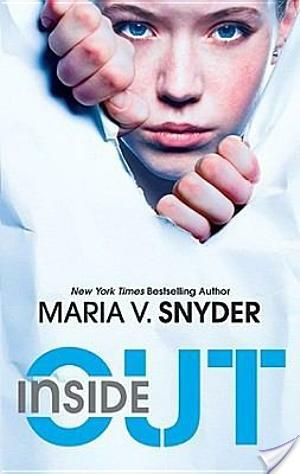 If you like the sociology of Mistborn, then you’ll most likely enjoy Inside Out by Maria V. Snyder. If you’re a sucker for revolution and uprisings and class conflict, then bro, you need this book. The pacing is super fast. Inside Out will keep you up all night turning pages, plus it will make the wait for Mockingjay go by much faster. Loved it just as much. Sheepy scene was extremely cute. And yes Riley was awesome! Great review, makes me want to go out and buy this book now! I've never heard of this book till now but now I'm excited to read it! Wonderful review. I really need to read Maria Snyder! Great review! I may have to go see if they still have this on netgalley, or if not, get a copy anyway. This author is the one who wrote Poison Study, right? I haven't read that yet either but it's on my TBR and I've heard so many good things about it. Sounds interesting, added it to my wishlist! Hooray for low expectations 😛 I wish I could always keep mine low. I'm very much a character-oriented reader, and Trella sounds like a protagonist I'd love. So cool when a book exceeds your expectations and you wind up loving it! Great review! Okay, so now there's no chance of me keeping my expectations low for this one. It sounds like everything I love in a book, especially being a dystopia junkie. The whole structure the book takes place in sounds really fascinating. I just can't wait to read it. So glad I read your review. I wasn’t going to read it based on the provided summary on Goodreads but decided to read the comments to see and clicked on your review. You changed my mind, I’m actually looking forward to reading it. Thanks!